Craig Levein insists Hearts’ target remains a European place next summer as he admitted only winning games will see supporters warm to him. A section of Tynecastle fans are sceptical about Levein’s return to management but he is prepared to work to win them over after signing a three-year contract. The club’s director of football is now performing a dual role after accepting owner Ann Budge’s invitation to take charge of the first team four weeks after head coach Ian Cathro was sacked. Levein hopes to reinforce the first-team squad before the transfer window closes tomorrow night. He explained that reaching the Europa League qualifying rounds through a high placing in the Ladbrokes Premiership is his priority this season. 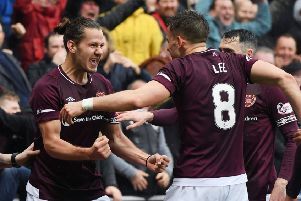 “We started out trying to get a European spot and that’s what we’ll try to do,” said Levein, who previously managed Hearts between 2000 and 2004. “The team will work hard. They will compete. If we do that, we will win. “It wouldn’t matter who was sitting here because we are not getting top managers like Jose Mourinho. Whoever we take is not nailed on to bring guaranteed success. So, whoever was here, there would be some people happy and some people unhappy. What I can do to affect their opinion is win games. “This is a demanding club. I know that more than anybody. We were in the Championship three years ago and we have got the club on a sound financial footing. “We have been in Europe, we finished third in the league and, although last year was a little but disappointing, we finished fifth. If you look back through Hearts’ history, finishing fifth is normal for Hearts. “Out there at Tynecastle it is demanding and I understand that. Part of me likes that challenge and that environment. Levein is attempting to bring in at least one, possibly two, new signings before tomorrow night. “I think we’re a little bit light,” he said of the squad managed for the last month by interim head coach Jon Daly.